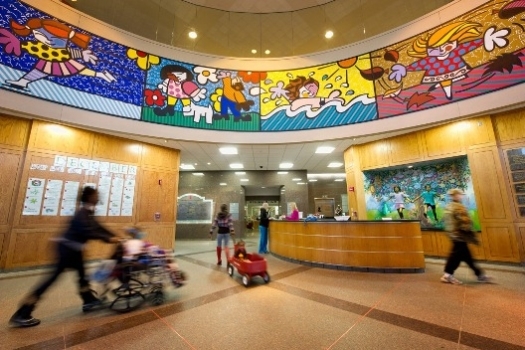 I am planning to write a series of posts that pertain to clinical issues, like palliative care services for improving outcomes in childhood cancer, but I wanted to take a step back and give some background first, especially about my time at St. Jude Children’s Hospital as a visiting student/intern back in late 1997. As I detailed in my introductory post from last year, “What’s MMMT got to do with it?,” I have no personal experience with childhood cancer but joined the childhood cancer community after watching my mother suffer from a very rare and aggressive gynecologic tumor. Cancer is bad to begin with, but my mom’s ordeal was extra bad on so many levels. No one should go through that—not my mom, and certainly not a child. I am a mother of two young girls and follow the “kids first” mantra. Kids first, always, right? Cancer research being no exception, right? But as you know, kids are NOT first, and that is so WRONG! I cannot understand or accept that, and that is why I am here. In addition to being a blogger, I am also an individual member of the Coalition Against Childhood Cancer (CAC2), where I have gotten involved in several different ways. I don’t know how I find the time, but I do, and I sleep better at night because of it. I hate cancer but love oncology, meaning that cancer is Public Enemy #1 in my book, yet I am fascinated by tumor biology and the nuances of cancer drugs. My degree is in pharmacy, and I was trained as a clinical oncology pharmacist. Many people have never heard of “clinical pharmacists”, who practice in the hospital/clinic setting, but I can assure you that these folks do exist and are very different than the more conventional “retail pharmacists”. Ask any of my former classmates about me, and they probably would say that I was “into oncology.” As discussed in my prior post Gold vs Pink, this interest and passion stemmed from my maternal grandmother’s battle with breast cancer, which did not have a happy ending. Anytime I would hear the words cancer or chemotherapy, my ears would perk up, because I wanted to have a better understanding of what cancer is and why it is so darn hard to treat. So I decided to devote my training to oncology pharmacy. Among the many requirements to obtain a pharmacy degree, a big one is the need to amass hours as an intern at a pharmacy. Most students opt for the typical retail experience, but I did 100% of my nearly 1,000 hours at the outpatient pharmacy of the University of Pittsburgh Cancer Institute. 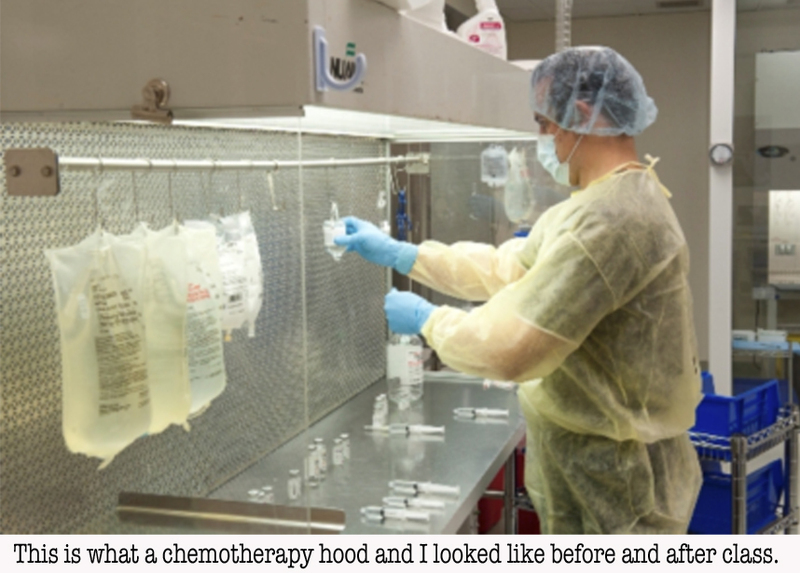 Much of my time was spent “under the hood” mixing chemotherapy and shadowing the pharmacists by checking orders. Because the outpatient pharmacy also housed an Investigational Drug Service, I also got some clinical research experience. I spent lots of time in an old closet with no windows, counting tamoxifen tablets as part of the drug accountability for numerous breast cancer studies. I quickly became very knowledgeable about cancer drugs, despite enduring some of these mundane tasks that nobody else wanted to do—and thus were delegated to the lowly student. I had gained massive experience in adult cancer treatments during those nearly 4 years as a student intern. I also had an inherent interest in general pediatric medicine. 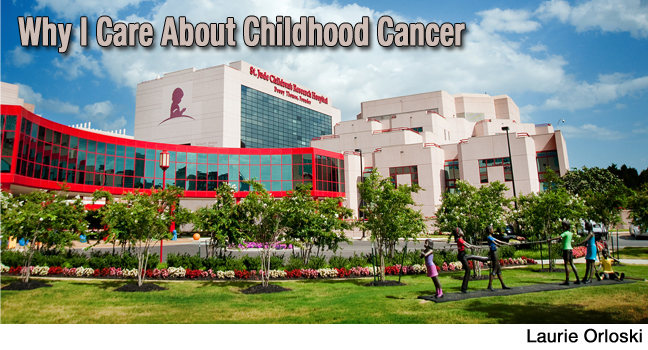 So in planning my 1 year of clinical clerkships/rotations required for my doctorate of pharmacy(called a “PharmD”) degree, I jumped on an opportunity to travel to Memphis to do a pediatric oncology rotation at St. Jude Children’s Research Hospital. That was the 6 weeks leading up to Christmas 1997. My time at St. Jude was the most eye-opening, unforgettable 6 weeks of my life. I often wonder, if it were not for my time at St. Jude, would I have made my way to the childhood cancer community as a volunteer? I would say, probably not. I was assigned to the Leukemia/Lymphoma service. All of the children without exception were treated per-protocol in a clinical trial. My job, as a clinical pharmacist in training, was to round with the medical team, review all of the patient charts, and recommend any necessary adjustments to supportive care aspects. I’ll explain more about clinical pharmacy services in a later post, but I will just note that my responsibilities were to work with the physicians and nurses to ensure optimal management of things like pain, nausea and vomiting, diarrhea, bone marrow suppression, and nutrition. I remember our youngest patient on service, a tiny infant diagnosed with cancer shortly after birth, which shocked me because I did not realize until then that babies get cancer. I also remember a boy that I encountered in the emergency room, who was about 6 years old and had been hit in the arm playing baseball, in that exact spot where he had a tumor. It was only discovered because of the imaging done as the result of his injury. I was young, had no children then, but I felt for those parents and was frightened by that chain of events. I remember thinking, how do you deal with something like that, where a child gets injured playing a sport and winds up with a diagnosis of cancer that very same day? During my time on service, the leukemia/lymphoma patients were “doing well” overall, meaning they were fairly stable and tolerating treatment as best as could be expected; however, the acute myeloid leukemia (AML) subset was having a tougher time than the rest. The mood, overall, was tenuous at best. There were some things happening on the Solid Tumor service. Two children who had been fighting for quite some time had passed away. Keep in mind that this was during the holiday season, so it made the unbearable all the more heart-wrenching for the staff who had come to know and love these kids. I’ll close with the encounter that I remember most vividly during my time at St. Jude. During one of my last days there, I was asked to deliver and provide patient/parent education on some discharge medication, some oral antibiotics and a few other fairly routine meds. As I started yapping, I locked eyes with the child’s mom who looked so beyond exhausted and stared back with the blankest look, she looked utterly traumatized. I knew that there was no way that she was really hearing a single word that I was saying, that there was no way her brain could process one more piece of information. That look really stuck with me, how those parents had been through hell and that it was far from over—and they knew it. In my prior rotations, the time of discharge was a fairly upbeat time, people were relieved to be getting their freedom back. In this case, however, these parents were leaving the hospital they had been practically living in – but leaving with a child who very much still has cancer. There was no relief or freedom to be had. Needless to say, those 6 weeks at St. Jude were emotionally draining. But they gave me perspective that I would never have gained elsewhere, and I am a better person because of it. Somtimes you have to see to believe—by seeing those kids and parents, I know that kids must come first in the cancer research arena. Maybe more people need to see it to believe it too, maybe that would get people like me – those who have not been personally affected by childhood cancer – to see how improving childhood cancer funding needs to be a national priority, not just a priority for those who have been dealt the blow firsthand. It is not like it would take 6 weeks for the lightbulb to go on, 6 minutes would be enough for sure. 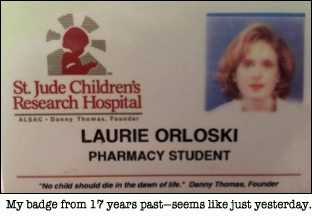 This entry was posted in Cancer, Childhood Cancer, Pediatric Cancer, Rare Disease, Uncategorized and tagged Clinical Pharmacy, Investigational Drug Service, Laurie Orloski, PharmD, St. Jude. Bookmark the permalink.